ASG-Jergen's money-saving Econo-Busters offer of a FREE PS-55 Power Supply with the purchase of an ASG Electric Driver has been a popular promo for an extended period of time (offer expires 12/31/13). ASG has recently informed us that, while the offer is still valid, there currently is a six-to-eight week lead time for shipment of the PS-55 Power Supply. 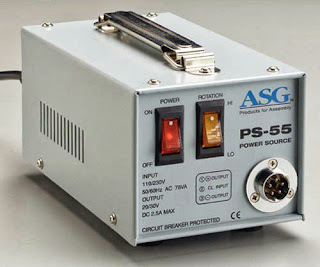 The PS-55 Power Supply is currently on backorder and is expected to resume shipping around the last week of October/first week of November. Orders placed for the eligible Electric Drivers will be shipped before the power supply. We will keep you informed of any updates regarding these lead times as they become available to us. To place an order for an ASG Electric Driver please visit QSource.com. You can also give us a call at 800-966-6020 or contact us via email. If there's a product or topic you'd like to see The Q Source Resource write about please let us know. We'd also appreciate if you share this blog post with your friends and colleagues via the social media links below. If you have questions or comments about ASG products or related topics please leave us a message in the comments section.